We’re all puzzle fans here, right? And sometimes we need something new, something fresh and engaging to rejuvenate our love of puzzles. We know all the classics — crosswords, fill-ins, logic puzzles, word seeks, Sudoku, cryptograms, and anagram puzzles — but there’s a whole wide world of puzzles out there to explore that you might not even know about! So, in today’s post, I’m going suggest some puzzles to check out, based on each of those classic solving experiences. From the New York Times and LA Times crossword puzzles to the Penny Dell Crossword App, there’s no shortage of terrific crosswords of all difficulty ranges awaiting solvers. But there are also some terrific variant crosswords for you to try out, like Double Trouble. 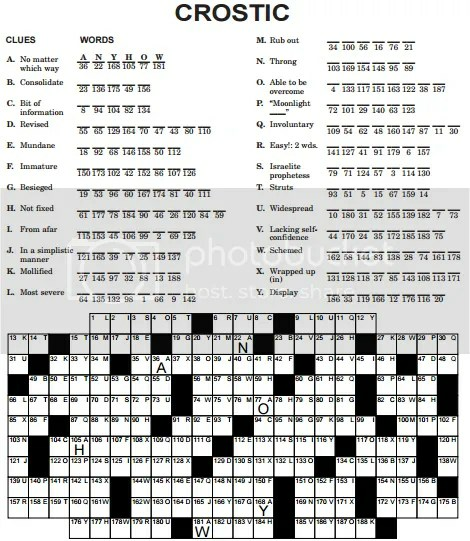 In a Double Trouble crossword, you can put one, two, or three letters into a box, making for a more difficult solve that the standard one-letter one-box crossword. But if you want to go a little farther afield, you can try something like Marching Bands. A Marching Bands puzzle has two sets of clues. The first set clues the rows reading across, with two clues per line. But the second set is where things get interesting. See those alternating rings of light and dark shading? The second set clues words reading clockwise along those rings, or bands. But maybe you like crossword cluing but you’d like an answer more interesting than just a grid filled with words. Fair enough, have you ever tried Crostics? Crostics, also known as Anacrostics (from our friends at Dell Magazines) or Acrostics (as made by friend of the blog Cynthia Morris), feature a series of clues and letter blanks to be filled. Although you don’t have the overlapping entries to help you puzzle out answers like crosswords or Marching Bands do, you can use the grid below as a solving aid. As each word in the message emerges, you can fill in those letters in the blanks above (using those same coordinates). 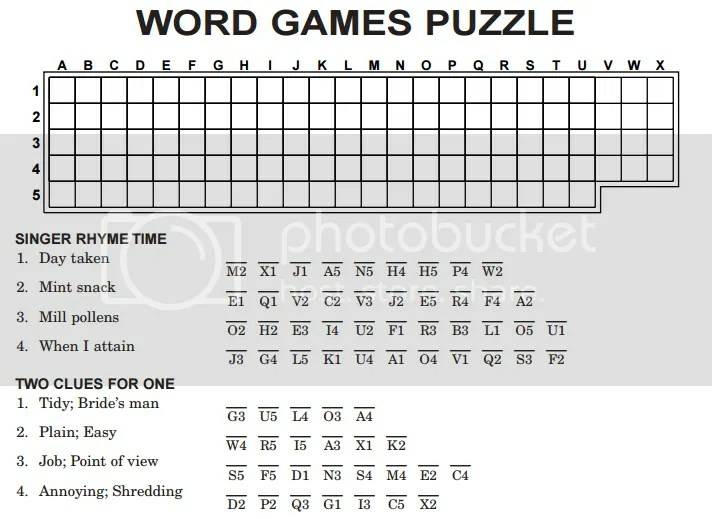 And for something along the same vein, you’ve got Word Games Puzzles. You still get the message reading out in a grid and the letter blank coordinates like in Crostics, but instead of a bunch of crossword-style clues, you instead get four mini-games to solve. One might be trivia or encryption, another might involve some wordplay, another might offer themed clues, and the fourth might be an anagram game. Each will challenge you in different ways, and the use of repeated letters — a change from Crostics with their one-to-one letter blank to grid letter ratio — gives you more than one chance to fill in the final message. Hopefully, one or more of these puzzles will pique your interests and offer a welcome new solving experience! Next week, I’ll have recommendations for fans of Fill-In puzzles, and in future installments, we’ll tackle word seeks, logic puzzles, Sudoku, and more! If you’ve got recommendations for your fellow puzzlers, please let us know in the comments!